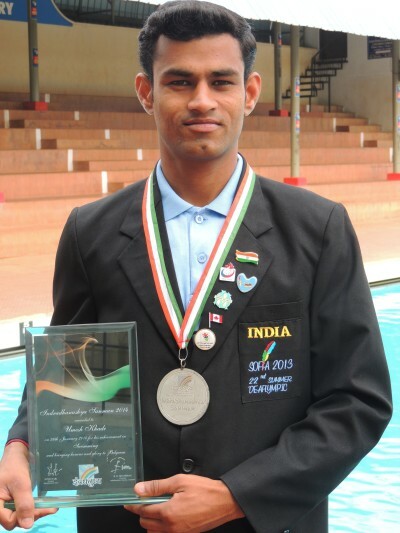 Swimmer Umesh Khade, who is deaf participated at All India Open Sea Swimming Competition held on 26th November 2014 at Mumbai. The competition is organized by the Flag Officer Commanding in Chief, Western Naval Command, Mumbai on the occasion of Navy Day. Nearly 600 swimmers from all over the India took part in this competition. Umesh Khade won the Bronze Medal in the Differently Able group. He is Deaf and Dumb swimmer and employee of Rotary Corporation Sports Academy. He is a member of Swimmers Club Belgaum and Aquarius Swim Club Belgaum and practicing at Rotary Corporation Sports Academy’s Swimming Pool, Goaves, Belgaum and Suvarna JNMC Olympic Size Swimming Pool, Belgaum under the watchful guidance of Ajinkya Mendke, Akshay Sheregar and Nitish Kuduchkar.